March 9, 1977, a dozen gunmen seized control of three buildings in the District, including the offices of the mayor and DC Council, and took nearly 150 people hostage. Two people died and then-councilman Marion Barry was shot. News4's Mark Segraves talks to people about the 40th anniversary of one of the darkest days in the nation's capitol. 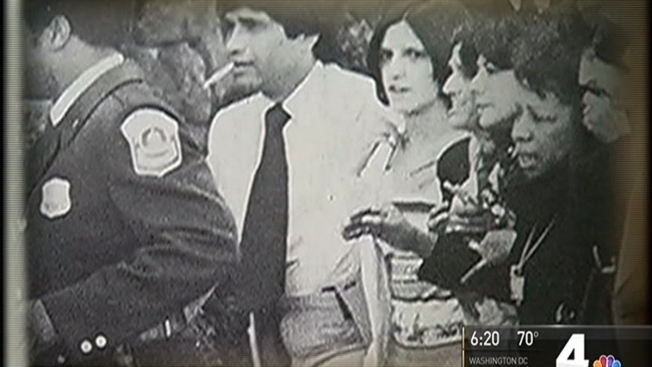 Forty years ago Thursday, a dozen gunmen stormed three buildings in downtown Washington, D.C. They took 150 hostages. They killed one person, a radio reporter. And they left dozens injured, including then-Councilmember Marion Barry. For 39 hours, D.C. residents watched and waited as negotiators bargained to free the hostages. Muslim ambassadors from Iran, Egypt and Pakistan worked with police to convince the gunmen, all Hanafi Muslims, to surrender. It came to be known as the Hanafi Siege, and it is the focus of a panel discussion Thursday night hosted by D.C. Council at the Wilson Building, one of the siege sites. The panel will feature Arrington Dixon, Ward 4 Councilmember at the time and former hostage; Maurice Cullinane, police chief at the time; Earl Silbert, then the United States Attorney for Washington, D.C.; and Mark Tuohey, an assistant U.S. Attorney at the time. News4’s Pat Collins, who covered the siege, will moderate. The siege was led by Hamas Abdul Khaalis, a former member of the Nation of Islam who became an outspoken critic of the movement after he broke off to form the Hanafi Movement. Khaalis set up his own Hanafi Muslim Center in Northwest D.C. in a home purchased for him by an associate, Los Angeles Lakers star Kareem Abdul-Jabbar, Collins reported on the 35th anniversary of the siege. In 1973, gunmen broke into Khaalis’ Hanafi Center and slaughtered seven members of his family, including his children and grandchildren. The murders were caught, tried and sentenced, but Khaalis wasn’t satisfied. He believed the men were sent by the Nation of Islam and that the judge in their trial ignored that connection. Four years later, Khaalis led a group of Hanafi Muslims as they stormed the Wilson Building (then known as the District Building), the B’nai B’rith International Center and the Islamic Center of Washington. "We have told this government to get busy and get the murderers that came into out house on January 18,  and murdered our babies. And our children. And shot up our women. Tell them the payday is here. We gonna pull the cover off of them. No more games," Khaalis told the Washington Post at the time. The majority of the hostages, over 100, were taken at the B’nai B’rith headquarters, then located on Rhode Island Avenue NW. They were not dead. Tragically, the gunmen at the Wilson Building did open fire, killing Maurice Williams, a young radio reporter for WHUR-FM. A security guard, Mack Cantrell, was shot. He later died of a heart attack, which his family has always blamed on the siege, News4's Mark Segraves said. Marion Barry walked out of his office after hearing the commotion and was struck by a shotgun pellet just above the heart. Barry stumbled back into the council chamber, where he was rescued via firetruck ladder and taken to the hospital. The next year Barry would be elected to his first term as mayor. Thirty years after the attack, the press room in the Wilson Building was dedicated to Williams. The ordeal finally came to an end the next day, after Khaalis agreed to meet with city officials and the Iranian, Egyptian and Pakistani ambassadors. Hostages were released from all three locations and Khaalis and his men were charged. All the gunmen were tried and convicted. Khaalis died in prison in 2003.